“The Man Who Laughs” got the last laugh at the annual Korea Musical Awards Monday night at Seoul’s Blue Square, winning acclaim for best musical, best actor and best theatrical arts. Its lead Park Hyo-shin won best actor -- an honor he shared with Choi Jae-rim of “Matilda” -- for playing the role of Gwynplaine. He also won best actor at the seventh Yegreen Musical Awards on Nov. 5 for the same role. “It’s been quite a while since I started appearing in musicals, since 2009, and I haven’t done many pieces. This puts more weight on my shoulders,” the singer-actor said in his acceptance speech, adding that he had been wondering if he was even worthy of being nominated for the award. “The Man Who Laughs” is a reimagined story based on the novel of the same name by Victor Hugo, not to be confused with “The Grinning Man,” a West End piece inspired by the same book. Choi Jae-rim, who shared the trophy, was acknowledged for his cross-dressing performance in “Matilda,” where he played a tyrannical school principal with a sinister edge. The musical also won the award for best ensemble, with its team comprising both adult and child actors. Park Myeong-seong, producer of both “The Man Who Laughs” and “Billy Elliot,” won the producer award. Jung Young-joo won the best actress award for “Bernarda Alba,” which also won the award for the best music and best musical performed at theaters with fewer than 400 seats. In her acceptance speech, Jung spoke out about gender equality. “I don’t like the word ‘actress,’ it’s just ‘actor.’ We put modifiers on all sorts of words, but no, we’re just actors. ... I would like to share this honor with all actors in this country who identify themselves as just actors, not actresses,” she said. “Red Book” won awards for best director and best choreography. 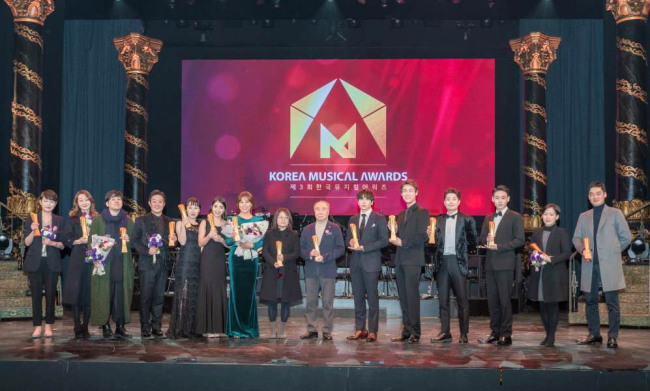 The night was glittering even before the trophies rolled out, as Korea’s biggest musical stars started their red-carpet walk before the ceremony kicked off at 7 p.m. The musical couple Kim So-hyun and Sohn Joon-ho from “Elisabeth” stepped out on the red carpet wearing outfits that seemed straight out of a fairy tale -- Sohn in a tuxedo and Kim in a peach-colored, bell-shaped dress. Kim said the dress was actually a costume for the musical, which she decided to wear for the first time at the ceremony. Shin Young-sook, who came up just short of a three-peat in the best supporting actress category this year, edged out by Kim Kook-hee of “Red Book,” wore a red dress that matched the carpet. Child stars from “Billy Elliot,” “Matilda,” “Annie,” “Elisabeth” and “The Man Who Laughs” brightened up the atmosphere Monday night. Rounding up the gang was the man of the hour, Park Hyo-shin, wearing a dandy suit with a pocket square as he beamed in front of the photo wall.